...to the dress! At last, I bought my dress!! I am beyond excited and relieved. The pressure of finding the one has been quite stressful. The process gave me some gray hairs but well worth it, I suppose. I don't want to reveal which dress just yet but for fun it's one of these! I want it to be #3 but I have a feeling its #2 by Monique L. They're all gorgeous on you! Congrats on picking the dress!!! Anxiously waiting your next post. i like the Vera Wang Fawn! i love looking at wedding gowns!! You look lovely in all the wedding dresses so far! I'm almost sad to stop seeing more wedding posts, haha. But I do like #2 the best! Can't wait to see the reveal! Congrats!! These dresses are gorgeous so i'm sure your gonna look amazing. But my guess is dress #3 :) can't wait to see pics. omg! These were the ones I mentally chose from your post too. Can't wait for your big day! Congrat! It was fun seeing your dress shopping experience. Thank you for taking us along.My guess is #2. They're all beautiful! You're going to look stunning walking down that aisle! I love all three, but the last is my personal fave. Either way, I can't wait to see what you picked! Well all of them are stunning so you're bound to pick a great look!!! Number one and two gets my vote! However, you look gorgeous in anything. Congrats! i like the Vera Wang Fawn! My guess would be the dress # 2. It looks absolutely stunning on you. Can't wait to find out which dress you choose. No 2 is perfection - it's made for you. any of these will be stunning. congrats on having this huge item checked off your list! All of them are amazing! Can't wait to see your choice! Congrats on saying yes to the dress! My fav is number 2 since it reminds me of my dress...I had a fit and flare gown with a sweetheart neckline with beaded belt. But they all look stunning on you! Now it's time to find accessories! omgosh you look amazing on the three dresses! my fav is the second and third one! you look GREAT in all the dresses! absolutely GORGEOUS! I want to get married all over again by viewing your posts! awww how exciting!! dress shopping is SOO fun!! i love all three of these! can you get married already so we can see which one you chose?! Loved the Monique Lhuillier Peony on you when you first posted it a while back... It looks perfect on you like it was custom made for your body AND your personality! So elegant, simple but with a pop of bling! You look like a princess in it (minus the tiara)... so happy you found the perfect dress and cannot wait for your reveal! When's your wedding date? These are all amazing! My personal favorite has to be the second, but in all honesty, they're all completely gorgeous. So excited to see which one you went with! In all of them you look amazing so any of these are a good choice! (: Looking forward to it! they're all LOVELY! I can't wait to know which one it is :) Congrats! I am in love with #2 but you look amazing in all of them so whichever you picked will be perfect! They are all beautiful! Congrats! I have a feeling that it might be the second or the third one. Congrats! Wow, the 2 vera wang dresses are breathtaking. I think the 3rd one is pheonomenal. I would love to wear vera wang for my wedding as well, and if you dont mind sharing, i'd really like to know what is the average cost of these dresses. Can't wait to see what you picked, they are all gorgeous! You will be a stunning bride! I don't understand how you have SO much money? A $30,000ish ring and a $5,000+ wedding dress...are you a millionaire or something? Oooh, I think they're all GORGEOUS. I particularly love the Monique Lhullier! ohhh i'm guessing the second dress! you look great in all of them! I'm very excited for you!! All 3 are beautiful, you cannot go wrong :) Are you going to do a sash? Looking forward to seeing the dress! I'm guessing dress #2. You look absolutely stunning. That rhinestone sash is so YOU. congrats!!!!! !i found my dress 2 months ago too!!!! such a big relieve ! Oh sooo exciting! I love the middle one but they are all gorgeous. You cannot go wrong! I can't wait to find out which one is the winner! Thanks for sharing the process. My best friend and I in the search for wedding dress and it's been nice to read about your adventures. I can't wait to find out which one you chose, I'm betting on the middle one! Cheers! All three look great! My guess is # 2. Wow those are all so beautiful! And they all look absolutely wonderful on you! choose number 3. i dont like number 1 at all. number 2 is too plain and boring. Love that sash on you for the Peony gown - Can I ask where you got it from? @Sylv Congrats! it was very difficult to pick between the three. I'm sorry but I'm not sure who the sash is by. Congrats!!! 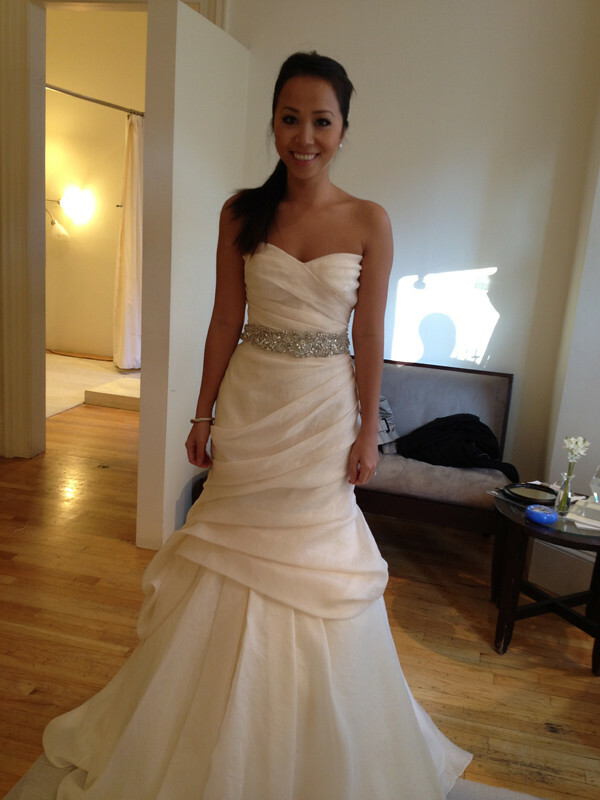 Vera Wang makes some of the most gorgeous dresses! However, I do like the Monique Lhuillier Peony the best!!! I love your blog by the way!!! I like both Vera Wang gowns. Amaaazing. Really like your style, I can relate to your classic, yet quirky, look. Oh wow! I have a favorite but any of the ones you posted will look amazing on you! Khatu I'm so excited for you!!!!! OMG I cannot wait to see! All three are BEAUTIFUL! You look stunning. I guess it should the right one! So beautiful!